he Chronos Time Recording system is a comprehensive software package that satisfies all the requirements of a modern time recording systems. It supports companies of any size and allows the economic implementation of simple to highly complex requirements. Regardless of whether the data comes from a PC, terminal, Tablet or Smartphone, the connectivity and control is implemented in a single solution. ny number of time recording terminals can be connected to SAP via a simple scheme, based on two standard modules. he Chronos Terminal Server functions as a control unit (communication software) for operating any number of time recording terminals and the connection of these to SAP. All terminal communication is based on TCP/IP. The Terminal Server and every connected terminal is updated and queried via XML data. From a technical perspective this means that (e.g.) ID data and employee data is sent to the Chronos Terminal Server via XML data packets and this then updates all relevant terminals with the supplied information. It makes no difference whether the terminals are installed in Frankfurt, Munich or New York. he Cobalt Data Connector is the connecting element between your SAP system and the time recording terminals and other time recording devices. The SAP PDC interface is used for transferring personnel time information and also for loading employee balance information for subsequent display on the terminals and all other connected devices. Your ERP system remains the central controlling system in your company. 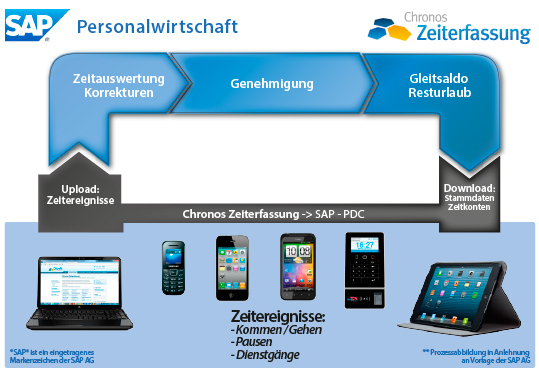 The Chronos components provide all the time information required by SAP for the various SAP-internal calculations. 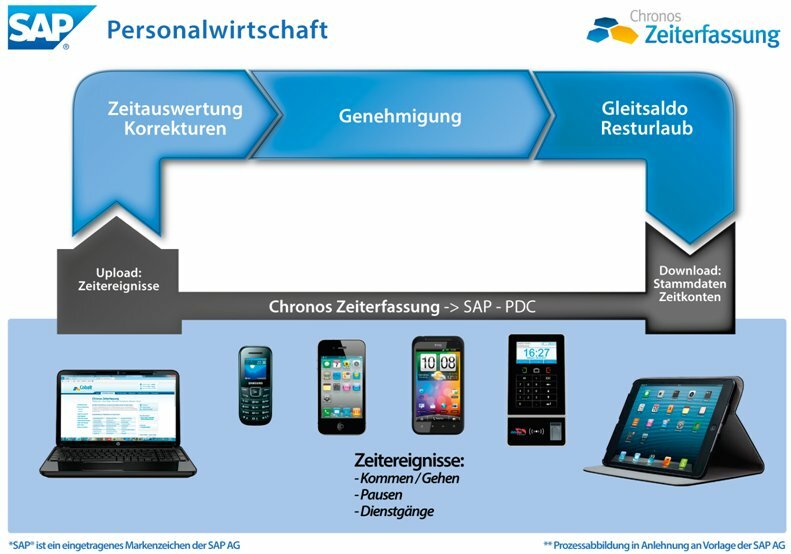 Updated balance information (glide time and holiday hours) and current employee data is provided back to Chronos by SAP.